TWO OF UK Prime Minister Theresa May’s closest advisers have resigned following the Conservative Party’s disastrous general election result. The BBC reports that May was warned she faced a leadership challenge on Monday from her party unless she sacked the pair. May has come under fierce criticism after she called a general election as an attempt to shore up her party’s parliamentary majority, but the end result was that the Conservatives lost 13 seats and its majority. In a statement, Timothy, Theresa May’s co-chief of staff, said he took responsibility for his part in the election campaign. “In particular, I regret the decision not to include in the manifesto a ceiling as well as a floor in our proposal to help meet the increasing cost of social care,” said Timothy. “But I would like to make clear that the bizarre media reports about my own role in the policy’s inclusion are wrong: it had been the subject of many months of work within Whitehall, and it was not my personal pet project. “I chose not to rebut these reports as they were published, as to have done so would have been a distraction for the campaign. But I take responsibility for the content of the whole manifesto, which I continue to believe is an honest and strong programme for government. Fiona Hill released a brief statement announcing her resignation on the Conservative Home website. “It’s been a pleasure to serve in government, and a pleasure to work with such an excellent prime minister,” she said. I have no doubt at all that Theresa May will continue to serve and work hard as prime minister – and do it brilliantly. As a result of the Conservative’s losses, talks with Northern Ireland’s DUP (who secured 10 seats in the election) are due to begin next week over forming a Westminster government. 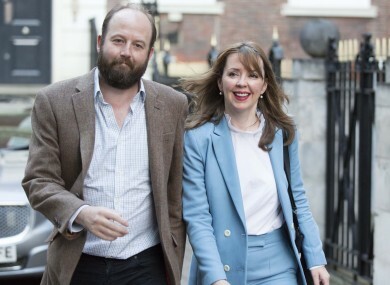 In a candid and revealing article this morning in the London Times, former Downing Street director of communications Katie Perrior – who left the post in April – wrote about Hill and Timothy and the influence they had. Perrior described the pair as “street fighters”, saying they had alienated a lot of people in government. Email “Two of Theresa May's top advisers resign following disastrous election result”. Feedback on “Two of Theresa May's top advisers resign following disastrous election result”.